What do we think about the new layout? Looks great! No changes needed. I like it, but have some suggestions to switch it up. I wanted change, but this is not what I was thinking. AGH! What were you thinking!?! GO BACK! GO BACK! I honestly don't know what I think. I'll get back to you. Alright. Let me know what you guys think. I was going for something brighter and more relaxing while still sticking with the service and love theme we had with the other setup. Vote and then comment, but be nice! Poll is only open for a week! Can you hear my screaming, "GO BACK!!" OK, it's not BAD, it's just.... bright. The plain yellow is kind of blah. And the scrolling script makes it look like we're trying too hard to imitate the days of olde. But don't mind me, I could get used to it. LOL-- Fair Enough. If I changed the background to a different color, would that work? or does it need a complete overhaul? Be honest. I'm tough. I can take it. I'm kind of trying to decide how I like it...I guess I had just become used to the old layout and I take a while to adjust. I think I'll just come back and vote later after I've looked around a bit more. Fair enough. Nothing has changed except the colors, and it only takes a click of a button to change it back. I added an option just for you. It's nice, the only thing is the font- the calligraphy, makes the "V's" look like lower case "B's" so it looks like above "here is serbice, here is lobe". Yup, the font would be my only beef with the whole thing. The blue is a good colour, very relaxing. Oh, is there any way to make the background slightly textured? I've changed the font. I don't think I can texturize the background. I will look into it though. Thanks for the input! You now have the power to cancel your vote. If you like it now, you can change your vote to reflect that. i like how you changed the font, but I think that the "at the feet of the king" font and the "forum, faq," etc needs to match one of the other two fonts...i'm just weird like that. Question: Is the theme based on CSS? No, they are JPEGs actually, so I created the theme myself... *sigh* I will fix it... again. I agree, blue is much better. But the font is still.... antique. *whispers* I still like it brown. JPEG's, gotcha. So you could use any JPEG image for the background? I really love the gradient on the navbar, btw. Love it! I haven't looked through everything yet, but thus far I really like it. *gasps* Purple..... well..... it's colorful. It isn't purple... lol. Adjust your screen resolution. I think it looks good. 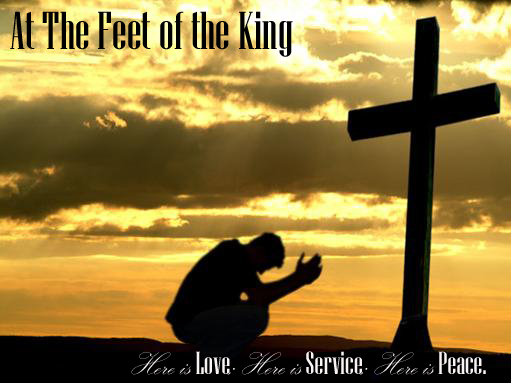 However I think the picture should have more to do with At the Feet of the King. 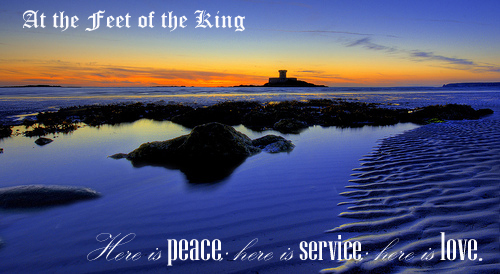 I'm not really sure what, but it seems like At the Feet of the King is sort of out of place on a picture of the sunset over the ocean. I like the colors though. The blue font that tells where you are on the forum just below the nav bar is a little hard to read. What did Maggie say at the beginning? Can you hear me screaming "Go back!!!" Well...it's alright. I can live with the color, but the picture was perfect before because it was at the feet of the King. I just changed the banner and only the banner. Do y'all like that one better? It is still at the feet of our King. Do we have to have feet in the picture?? I know the whole color scheme doesn't mix well, but I can't keep changing it for every other banner we try to do. I would change the Font of the "Forum/ F.A.Q./ etc" and probably make it a yellow-brown gradient (*sigh*... there's the brown again). Let me know what you think. For those of you confused. This was the other banner. i LIIIKE the bright blue! !